Excited for your upcoming road trip but worried about how your little ones will handle car sickness through winding roads? Motion sickness can be tricky to combat. Researchers struggle with why some people feel nauseous every time they take a car trip and others travel without any discomfort. Physicians too are troubled by why car sickness affects some children more than others. While the problem doesn’t seem to affect most infants and toddlers, children ages 2 to 12 are particularly prone to go green in the seat. 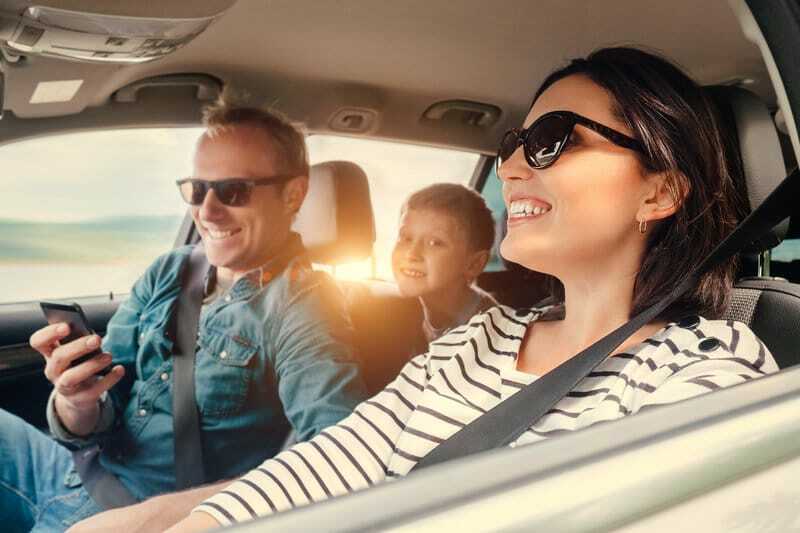 Learn tips to help prevent car sickness and keep everyone a healthy shade. What causes car sickness (motion sickness) exactly? According to the Centers for Disease Control (CDC), motion sickness occurs when the movement your eyes see differs from what your inner ear is sensing. SIT IN THE FRONT: Sitting in the front seat, you are much less apt to experience a difference between what you see and how your body interprets motion. WATCH YOUR PRE-TRAVEL MEALS: Heavy, spicy, or fat-rich foods may worsen motion sickness in some people. STOCK UP ON GINGER AND PEPPERMINT: According to Healthline, Ginger is an effective natural remedy commonly used to treat nausea. Although why it works is not fully understood, experts believe that compounds in ginger may work in a similar way to anti-nausea medications. Peppermint aromatherapy has been shown to be effective at reducing nausea in 57% of cases. LIMIT READING AND VIDEO GAMES: When reading or playing games in the car, your eyes, fixed on the book or device see the interior of the car with peripheral vision see the interior of the car and interpret that you are still. However, as the car moves over bumps, turns, or fluctuations in velocity, your ears disagree. Your inner ear sensors play a major role in how your brain interprets the motion you feel. This is why motion sickness is common in this situation, according to Scientific American. If you have this sort of reaction it is usually helpful to stop reading, or playing your game and look out the window. KEEP VIEWS OPEN: Since motion sickness happens when the body, the inner ear, and the eyes send conflicting signals to the brain, it is believed that passengers are more likely to get nauseous when they have limited exterior or frontal views. The brain is better able to decipher motion when it has a full view of its surroundings. INCREASE VENTILATION: When motion sickness symptoms start to arise, getting fresh air can help ease your symptoms. GET OUT AND MOVE AROUND: Restore your sense of balance by making regular stops during your trip so passengers can get out and move around. This will help nausea symptoms from progressing to full-blown car sickness. USE MUSIC: The CDC recommends music distraction as an effective, non-drug prevention technique for motion sickness. Furthermore, research shows that music therapy can offer positive benefits during episodes of motion sickness. Before you set off on your next road trip adventure, contact Scott’s Fort Collins Auto to ensure your car (and tires) are prepared for winter road conditions. Call (970) 682-4202 to arrange your next visit.